Gun Control: 'Only Modest Change' In Opinion Since Newtown Shootings : The Two-Way The latest Pew poll shows a slight upward shift in the percentage of Americans who say it's more important to control gun ownership than it is to protect the right to own guns. But deeply felt feelings appear to be limiting the change. 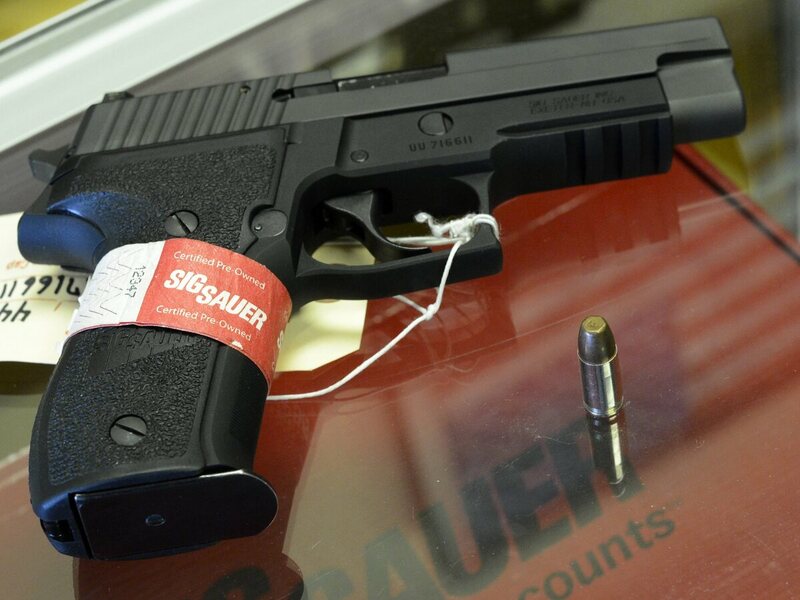 A Sig Sauer handgun on sale at a shop in Tucker, Ga.
"The public's attitudes toward gun control have shown only modest change in the wake of last week's deadly shooting at an elementary school in Newtown, Conn.," the Pew Research Center for the People & the Press reported Thursday afternoon. Pew's latest national survey of 1,219 adults was done Dec. 17-19 (Monday to Wednesday). So the Dec. 14 attack that took the lives of 20 children and six adults at Sandy Hook Elementary School was on most respondents' minds. Pew's Andrew Kohut tells All Things Considered that polling shows the Newtown attack "has drawn as much public attention as the entire presidential election at the end" of last year's campaign. -- 49 percent of respondents agreed with the view that it's more important to control gun ownership than it is to protect the right of Americans to own guns. 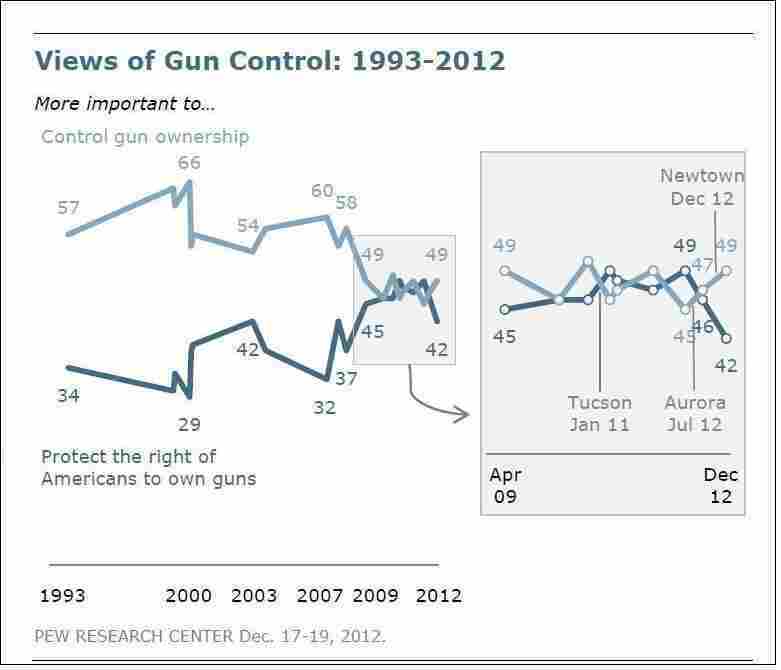 -- 42 percent said the right of Americans to own guns is more important than gun control. -- While this was the first time since President Obama took office that "significantly more" respondents make gun control a higher priority than the right to own guns, the shift was not dramatic. Following the July mass shooting at a movie theater in Aurora, Colo., "47 percent said it was more important to control gun ownership, while 46 percent said it was more important to protect gun rights." The new survey comes with a margin of error of +/- 3.4 percentage points on each of those major results. Pew's findings underscore what we noted on Saturday: that polling in the past has shown that public opinion won't necessarily shift much after mass shootings such as those in Newtown, Aurora, Tucson or on the campus of Virginia Tech University. The modest change in opinion can be explained in large part, Kohut said, by the depth of most Americans' feelings on the issue. Eighty percent of respondents, he said, told Pew "I fell strongly about this." "It's not easy to move strong opinions," Kohut added. Also a factor: Just under half of those polled believe gun ownership does more to "protect people from crime" than it does to "put people's safety at risk," Pew reports. For many Americans, said Kohut, that's just "fundamental." One exception to that general view: Pew found that 65 percent of those polled believed "allowing citizens to own assault weapons" makes the nation more dangerous, not safer. More from Kohut is scheduled for today's broadcast of All Things Considered. Click here to find an NPR station that broadcasts or streams the show. Later, we'll add the as-aired version of the interview to the top of this post.